My grandchildren started saying no thanks to bedtime books when they slept over in favor of stories about their parents as little kids. Lately, they've been asking for tales from the days when I was a little girl! Yikes.....not always easy to retrieve on demand! Thanks to my friends Bob at Axiesdad and Grandma Kc over at Amaraland who do such an awesome job sharing their childhood stories and memories; I am encouraged to do the same for my grandkids.....so here goes! I learned to ice skate in my own backyard. No big deal if you grow up in the winter wonderland of snow and ice for months on end as I did in Michigan back in the 50's. Folks still do this today in the northern states....but those years of skating and sledding are some of my favorite childhood memories! Every winter, Daddy would freeze the backyard; after first listening to weather predictions, checking the sky or conferring with neighbors. If there was a big snow on the way; he'd wait and shovel and freeze the next night. Sometimes we were disappointed...our little rink with the banked up sides would be nothing but chunks of crusted snow or ice! He'd have to start all over again. He put as much time into getting it right at he did the summer gardens! Here I'm a daring one-legged ten year old and my brother Dave is about six. Easy to show off when Daddy's holding tight! But not nearly as confidant am I alone with Dave.....he's about to launch ahead and I look a little leery; especially since it appears I've already fallen a time or two! Believe me...that look on his face spelled trouble! many more years! These cards were quite novel and a hit with all Mom and Daddy's friends. I was 13 when along came a sister; and two years later another brother. Our folks loved planning for these cards months ahead of time......just as many of us do today! They stopped when I was half way through college...and Daddy changed jobs and had to be on the road a lot. Dave and I love remembering those early years.....when it was just the two of us. 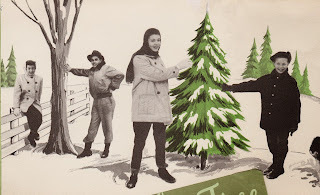 Mom loved being outside too and I remember her skating so elegantly in her skirts or dresses. She'd pull pants up under them and tie on a colorful babushka and out we'd go to play in the snow. Yes, Mom was lots of fun.....but that's not why we love this picture. Dear Dave...we can still tell when you're up to something with those mischievous eyes! We may have been posing for another card idea....or just looking cute. But Dave had a snowball hidden in his hand......and that's why it's a crazy funny photo! I can't recall if he threw it at me..... or at our dad......but I do remember us all laughing so hard and so long. Congratulations on your new gig, Lisa! I'm so glad to have found you at the Grand Social! Thank you for reading and for liking my FB page, Joy. I would love the new Let's get Social button.......I have been out of it for awhile since my husband died. I look forward to contributing each month with you and the others. Nice to meet you, new friend! I love this story and I love the pictures! 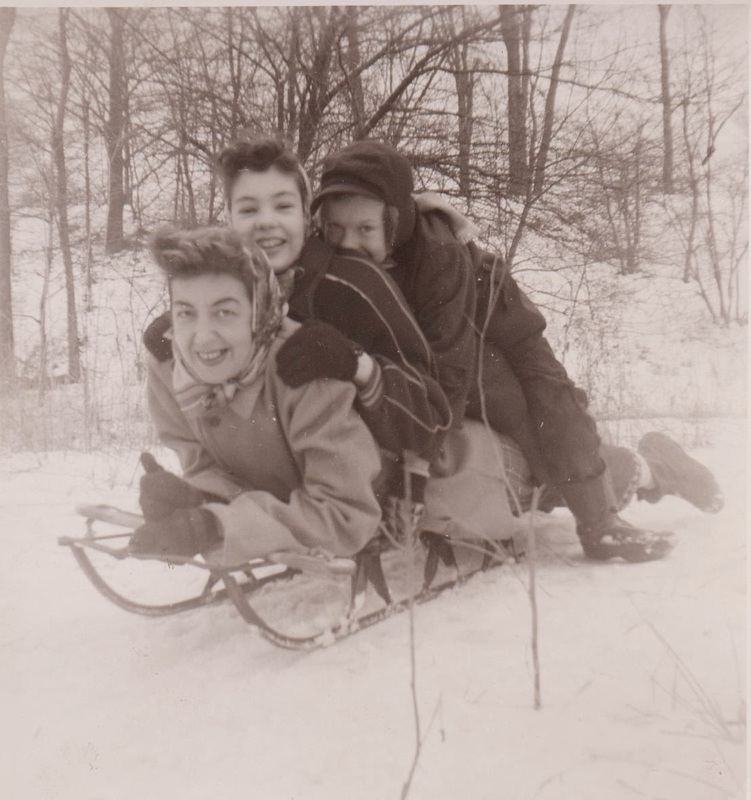 Having also grown up and suffered through many of Michigan's arctic winters I remember bundling up in all those clothes to go out and play! Great memories and I love that you remember your brother had a snowball in his hand! You have to do more of these -- we all do! Looking back on our childhood is lots of fun and sharing it with our grandchildren makes it even better. You have been a great motivator Kc......no one does it as well as You! Wonderful memories! Our dad made a backyard skating rink for us, too! And we sure felt like we were "all that" being able to skate any old time we wanted. Others had to wait for a ride to the park pond about 10 minutes away - but not us! Of course we also frequented that pond, and I fondly recall daddy, and sometimes mother too, sitting in the cold car and watching us for several hours. What parents don't do to make their kids happy. That love and generosity spans the decades! I'm so glad you have pictures that prove it to show your grandchildren! 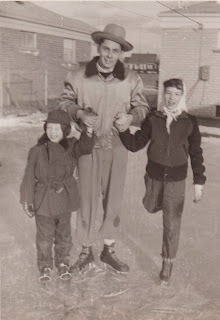 Thanks for reminding me about our parents sitting in the cold, Joyce.....mine did when I got older and wanted to meet up with my pals at a local rink at night. One of them would drop me off....and park a discreet distance away and just wait! Thanks for your story. 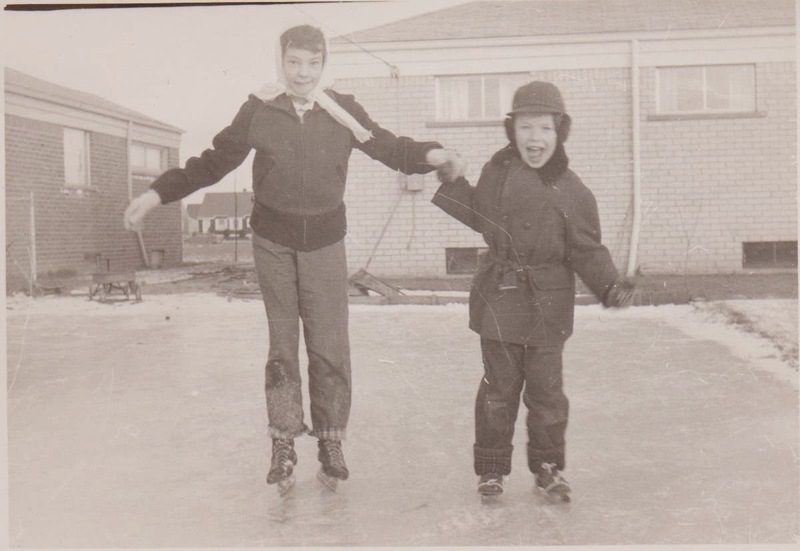 Recently have been thinking about this same memory and how the Rouge Park ice rink and warming house, along with the toboggan slides and sledding hill were all such wonderful winter fun places, that backyard ice rink was something special. I remember continually checking out my bedroom window that looked right onto "the pond" to see if it was ready yet for us to tie up our skates and initiate it. Once we did, everyday after school or on those Christmas vacation days we could spend a lot of time out there. Today when I see the same space and wonder, how did it seem like such a big rink in that small space? But it did, because it was huge for all of us! By the way, we grew up on Pierson. Pierson .......we were neighbors! I lived across from weatherby ...one of four Bickley kids. I was 11 in 1955.....probably way older than you! Thanks for reading and commenting. Private message me via Facebook.....maybe we were pals! LOVE this memory, Joan! What a smart father you had. And what great cards to have. I enjoy these memories you wise grandmas (and grandpas) share on your blogs. So much fun to read. Happy, exciting times for you this new year....new jobs and new grandbaby anticipation! Enjoy every moment my friend! What a fun post! and how special that you can share it here for your grandchildren and for all of us as well. 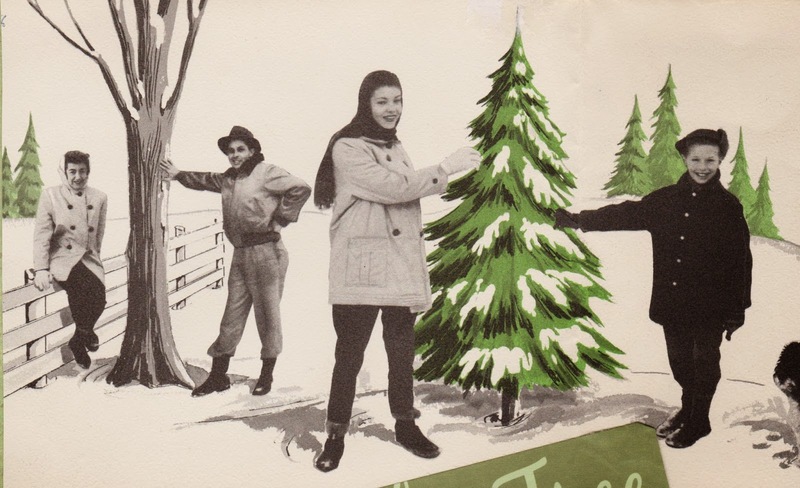 Brings back good memories for me, too, thinking of sledding and snowball fights with my sisters growing up. 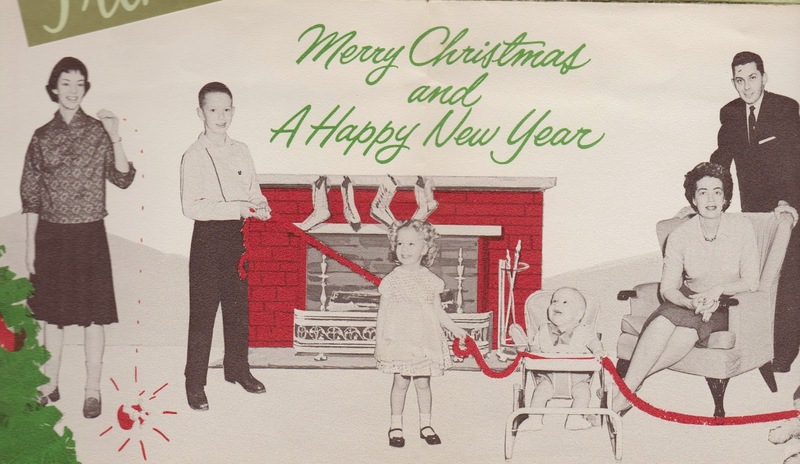 And LOVE those Christmas cards! funny how popular that kind of 'retro' stuff is with the young folks these days. Your father was very clever, and creative. Thank you for reading and commenting, Linda! Miss my dad after writing this and recalling those days too. Glad to be leaving these posts for the grandkids. Someday they'll sit down and read them all they way we went through old letters, scrapbooks, boxes of photos!